Many investors are catching onto the gold and silver bug which less than a year ago was completely dormant. Investors who bought those stocks when they were ignored may be sitting on large gains already even in the early stages of a bull market doubles and triples. It may go even further. Unlike gold another yellow metal is ignored by the masses but smart investors are wise to the fact that uranium may be one of the best opportunities out there right now. Uranium is the antidote for global warming which may be one of the biggest immediate threats. Nuclear is the safest, most effective and efficient base load energy source. I'm not alone in this opinion. New York State Governor Cuomo is giving credits to nuclear plants to wean off of fossil fuels. Climate change is a global problem and this is increasing the realization that next generation nuclear is our best option. How do I sense this is beginning to be realized right here in the US? There are five new reactors under construction in Georgia, Tennessee and S. Carolina. Even billionaires such as Microsoft Bill Gates believe in next generation nuclear and the implementation of small modular reactors which are much more affordable then the costly huge forty year old nuclear reactors being used today. What about renewables? I am a big proponent of wind and solar energy but it doesn't have the capabilities to make a considerable change in carbon emissions like nuclear without huge economic repercussions. Even radical environmentalists who once opposed nuclear are now turning more positive as they realize that just looking at wind and solar is not a viable option. Right now we may be in a bust for the US nuclear sector as there are many old reactors on the verge of being retired despite new reactors under construction. However, like the 1970's we could have a technical breakthrough and update the old reactors with safer, smaller and more efficient next generation nuclear reactors. We should invest in this forgotten sector when it is dirt cheap and in the midst of a bust as the long term forecast for nuclear is very strong. Climate change and global warming concerns will not go away and I believe America will continue to build and update its nuclear fleet over the next 5-10 years. Investors may wise up to this soon that nuclear is not on its way out, but waiting for a new beginning. The next nuclear renaissance will be with next generation small modular reactors in the battle to fight climate change. 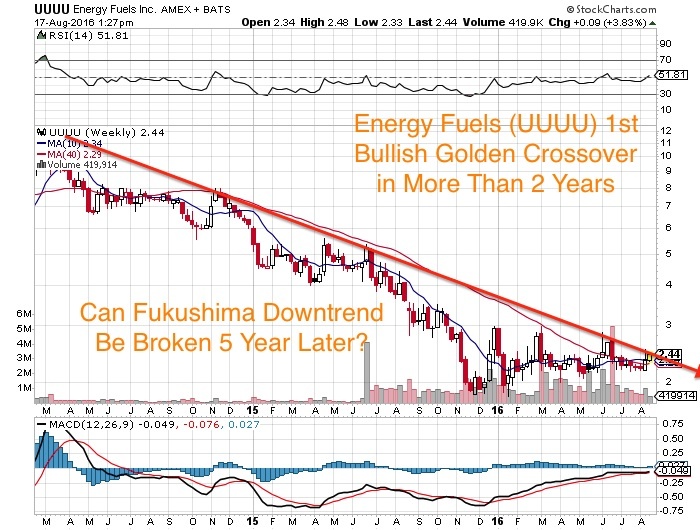 One of my holdings and website sponsors Energy Fuels (UUUU or EFR.TO) is continuing to base but I believe it could be turning the corner as it makes a bullish golden crossover of the 50 and 200 day moving average. In my opinion its the best way to invest in a pure play US uranium producer. There are not many uranium companies on the NYSE and very few that have cash, contracts, production and making acquisitions. Energy Fuels acquired Uranerz last year for its low cost In-situ recovery operation in Wyoming and recently bought a low cost ISR operation in Texas. This week Energy Fuels announced exciting drill results from the property acquired from Uranerz at Nichols Ranch which continues to hit some of the highest grade uranium for ISR in the United States. I have been a big believer in Nichols Ranch in the Powder River Basin for years with Uranerz and this could be a high quality operation for years to come. 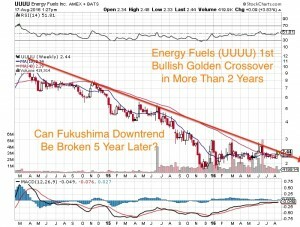 Energy Fuels was an $80 stock back before the Fukushima uranium bust. Now its under $2.50, but if uranium turns it could see similar moves to what we are now seeing in the gold stocks if not possibly bigger as there are not many good uranium companies. All it takes is one black swan from Putin or one mine in the Athabasca to flood to change the interest in Energy Fuels. Technically, the stock appears to be possibly breaking out of a major bottom as the 50 day moving average has crossed above the 200 Day. I am hoping to see some follow through on this move and an eventual change in the long term trend. Energy Fuels tried to make this move back in 2013 but it was a fake out. Could this be the signal of the final bottom five years after Fukushima? Although I may have been early and faked out in the past this technical turnaround must be monitored as the gains could be humongous if uranium transitions from a bear to bull market. Watch to see the 200 Day to flatten out and move higher over the next few weeks. Disclosure: I own securities in Energy Fuels and they are also a website sponsor. Owning securities and receiving compensation is a conflict of interest as I could personally benefit from a price/volume increase. Please do your own due diligence as this is not financial advice!See my full disclosure by clicking on the Featured Companies link above. Investing in stocks is risky and could result in losing money. Buyer Beware! I am biased towards my sponsors (Featured Companies) and get paid in either cash or securities for an advertising sponsorship. I own shares in all sponsored companies.You must do your own due diligence and realize that small cap stocks is an extremely high risk area. Please do your own due diligence! Tell your friends! Please forward this article to a friend or share the link on Facebook, Twitter or Linkedin. For informational purposes only. This is not investment advice. May contain forward looking statements. Are You Ready for The 2nd Leg Higher in the TSX Venture in 2018?